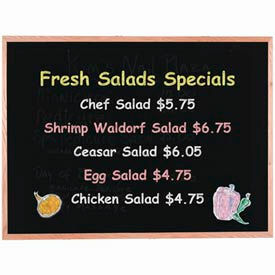 Chalkboards Are Used For Creating Signs, Menu Boards, And Other Announcements In Restaurants, Schools, Offices, And Residential Use. Chalkboards are made with aluminum, porcelain, steel, and wood for long lasting durability. Chalkboards provide efficient writability and erasability for broadcasting messages clearly and effectively. A-Frame board features steel reinforced corners, weather resistant hardware, floor leveling system and full width aluminum hinges for indoor and outdoor use. Magnetic porcelain board surface creates a magnetic tackboard used for classroom environments. Reversible board features steel lock clamps that adjust to secure board to the preferred position. Chalk tray with protective end caps available on some models. Available types include A-Frame, Display Style, Duroslate, Porcelain, Porcelain Magnetic, Reversible, Tabletop, Valu-Rite, Wood Frame Duroslate, and Wood Frame Porcelain Magnetic Chalkboard. Board color finishes are Black and Green. Frame colors are Black, Cherry, Oak, and Silver. Dimensions vary per model. Chalk Is Designed To Create Signs, Sidewalk Art, And Other Notices For Restaurants, Schools, Offices, And Residential Use. 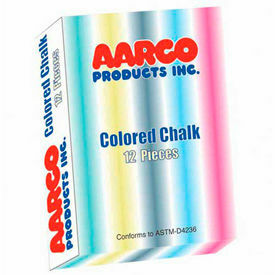 Chalk is solidly made for long lasting durability and dependability. Chalk provides efficient writability and erasability on chalkboards for broadcasting messages clearly and effectively with indoor and outdoor use. Includes 12 Pieces Per Box. Colors are Assorted and White. Package quantities vary per model.